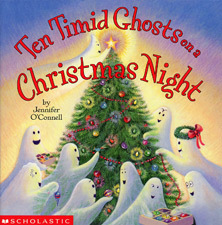 Cartwheel Books - Scholastic, Inc.
One Christmas Eve, the ten timid ghosts discover Christmas decorations up in the attic. They find a tree, decorate it, and put up lights outside. Will Christmas come? Join the ghosts as they hear, see, smell and feel strange things in the air that night. Is someone coming? Is that a sleigh in the sky? 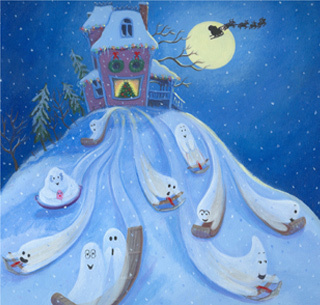 Count from one to ten with the ghosts as they experience the magical spirit of Christmas! “The holidays are over, but Ten Timid Ghosts on a Christmas Night is still the book that Matthew picked out a few nights ago for a bedtime read.